Laura Catena, one of Argentina’s best wine producers, is also an emergency-room doctor in San Francisco. 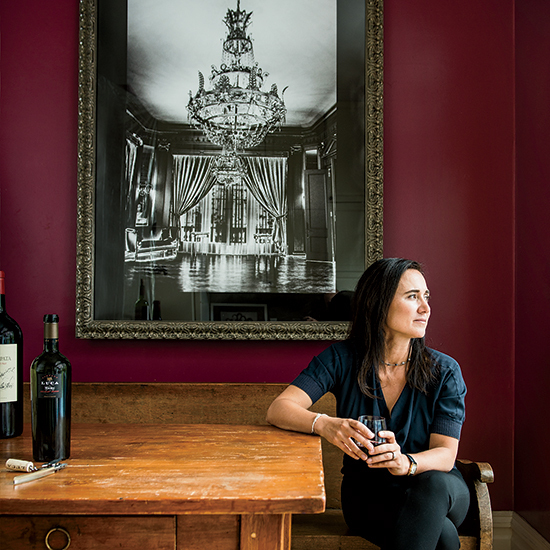 She talks about her mission to revive the Argentinean wine industry and her strategy for dealing with a hangover. Q. Which first interested you, medicine or winemaking? A. Early on, I had absolutely no interest in joining my father in the family wine business. I wanted to help people. I think if I didn’t like men so much, I’d probably be a nun—I’m not kidding you! Q. What changed your mind? A. The pivotal moment was when I went to the New York Wine Experience in 1995. It was the first time an Argentinean winery had been invited. I got all dressed up and I was standing in the little booth where I was pouring my family’s wine, but only a few people came by to taste. People would read our sign—Bodega Catena Zapata, Argentina—and they were like, “Oh. Well. I’m not interested in that.” And they’d walk by. But I saw the lines outside all of the French and California booths, and I realized, My God, my dad needs some major help here! And my country! Q. You went ahead and became a doctor, though, so I have to ask: Is wine really good for you? A. Any kind of alcohol has cardiovascular benefits as long as you drink it in moderation—it reduces your risk of heart attack, stroke, dementia. But that’s in moderation. Drink more, and you lose everything you would have gained. Q. So what defines moderation? A. Different countries have different standards. In the US, one drink per day for women, two for men. But in Greece, it’s one-and-a-half for women, three for men. Also, you can’t squeeze all the drinks into one day and say, “I had seven drinks on Friday, so that’s one drink per day. Moderation, right?” Wrong. Q. Out of curiosity, for the immoderate among us, do over-the-counter hangover cures work? A. A hangover is basically dehydration. Drink lots of fluids and take two aspirin. But my main advice is don’t get the hangover to begin with. Q. When you aren’t busy putting people back together in the ER, you’re usually in Argentina at your family’s winery. How much time do you spend there? A. I’m in Argentina about four months out of the year. But if you count talking on Skype as being in Argentina, then I’m in Argentina 70 percent of the time. Q. What do you think Americans’ biggest misconception about Argentinean wine is? A. Probably that Argentina only just showed up. But Argentina’s been making wine for more than 400 years. People also don’t realize that the real boom in California wine came after Argentina’s. The whole time you guys were having Prohibition, we were drinking wine. Q. What’s your favorite restaurant in Buenos Aires? A. Oh, man…that’s a tough one. But I love this Vietnamese place called Green Bamboo—Vietnamese food by Argentineans, which is completely ridiculous. But you sit on the floor, there’s great music and amazing cocktails, and the room is all red and dark. It’s a young crowd. Q. What’s your favorite wine ever? A. It was a bottle I had at Tegui, which is also in Buenos Aires. The restaurant’s behind an unmarked door, but you walk in and the place is just beautiful. We had this bottle of 1939 Château Latour, which is my dad’s birth year. It was so floral and so elegant. I hate to sound sappy, but that’s almost like my dad! Q. There’s a lot of counterfeit old Bordeaux out there. Are you sure the bottle was real? A. I did have some doubts about it, so I asked [Master Sommelier] Larry Stone, and he told me, “No one falsifies 1939.” Apparently, it’s a terrible vintage. Q. What about Mendoza? If people are visiting wine country, what do you suggest they do? A. One of my favorite things to do is to go to Cavas Wine Lodge and have lunch there. You sit outside and you’re surrounded by vineyards. Another place I love is in Tupungato. It’s called El Hilo, and it’s an all-fish place, but it’s fish from the local streams. I’ve had fish from all over the world, and this beats everything. Then there’s Almacén de Uco. It’s fantastic. They’re open on weekends only, and they do this outdoor barbecue; they’re usually roasting a pig. That’s where the locals in Mendoza go on the weekend. Q. Finally, something I’ve wondered about for a long time: How come so many doctors are wine collectors? A. I think wine is very romantic, and doctors are romantic people. They play this role in the world of helping others—that’s why you go into medicine, not to make money and so on. Plus, most doctors are really stressed out, so they probably need something to chill them out. And they’d be much too embarrassed to take a Valium.